As of October 15 one thing is certain - the best espresso in the Canary Islands can now be found in Santa Cruz on the beautiful island of La Palma. 27.10.2015 - That is to say: in ‘El Café de Don Manuel’, opposite Plaza España in Calle Real. Owner of the bar, Rayco Rodriguez, participated in the Spanish Barista Championships which were held on October 14 and 15 at the Congress Centre in Málaga. Rodríguez, who is sponsored by the brand Tirma, had earned his place in the competition having been previously crowned Canarian champion. Within Spain, however, the Canarians are not best known as coffee connoisseurs. "Up to now, the ‘Canarios’ have not put so much emphasis on good coffee, more that it should be cheap. Though, myself and seven or eight bars around Santa Cruz are already making sure we serve a good coffee quality to attract guests", says the Palmero. 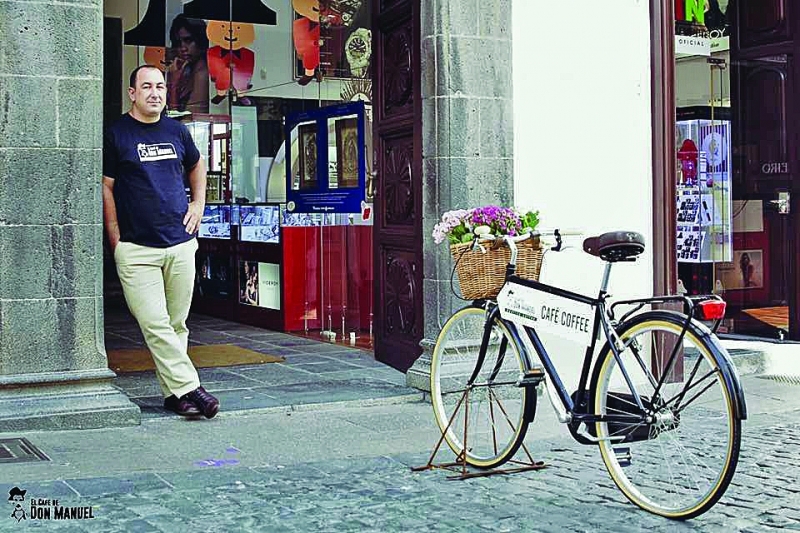 Rodríguez was excited when he travelled to Málaga: He was one of 17 baristas who journeyed from all over Spain to take part. More than half of the competitors having been participating for years: They are the Spanish (coffee) ‘crème de la crème’. "For me it was quite a surprise and success, to move into the final after the first day of the competition" the Palmero said modestly – and then went on to win his category. The prize for best coffee overall went to Damián Seijas, a representative of Galicia, but it was Rayco Rodriguez whose espresso made the day. "I got the award for the best espresso coffee. This is unbelievable for me, especially because the level was really high. I use the Don Manuel branded Tirma. The coffee comes from Panama and is superbly cultivated. The bean grows at 1,600m above sea level and at a constant 21 degrees centigrade. It has an aroma of jasmine and pineapple. If you want to experience this wonderful taste, just keep the coffee as long as possible in the mouth", says the expert. On the question of how a layman can recognise a good quality coffee, he only said: "I have a regular guest who told me that he drank five to six cups of coffee daily. He used to always have an upset stomach by the end of the day. Since he is drinking coffee with me, it's different. He still drinks a lot of coffee but now does well on it. And about his win: "In order to make a really good coffee, various factors have to be right. And to be within the top Spanish baristas, you have to keep improving and learning." The Tirma brand first put this delicious-sounding coffee on the market about three years ago after rigorous testing and experimentation. The company wanted to find a coffee to import that would meet the highest demands. The result appears to have been well worth the effort. Produced with news.CMS in 0,0620 seconds.